Pine straw is quickly moving up the list of must-use mulch options. For years we have used it at Peter Wimberg’s home, completely blanketing the front landscape and its gentle slope to the street. After the perennials are cut back in late fall, or simply left as is, we cover the landscape with a generous amount of pine straw. Unlike hardwood mulch which can become compact after the winter season, pine straw remains loose enough that ‘fluffing’ is not required come spring. Some mulch is dyed, creating an unnatural color. Lesser quality mulch uses shredded pallets and waste wood materials. In a time when gardeners are becoming more aware of our impact on the environment, the use of all natural materials, such as pine straw, is a very attractive alternative. Anyone who has hauled bags of mulch knows they can be wet, heavy and even slippery. The plastic bags rip and break open, and when you are done, there’s the issue of unwanted plastic. Pine straw bales, even when wet, are far easier to move about the garden and the only leftover material are small pieces of twine. Pine straw seldon becomes overly compacted. Hardwood mulch, when compacted, restricts air and water circulation. I’m yet to find pine straw that was so tight that it impeded healthy air and water circulation in the garden. Ideal for hillsides. 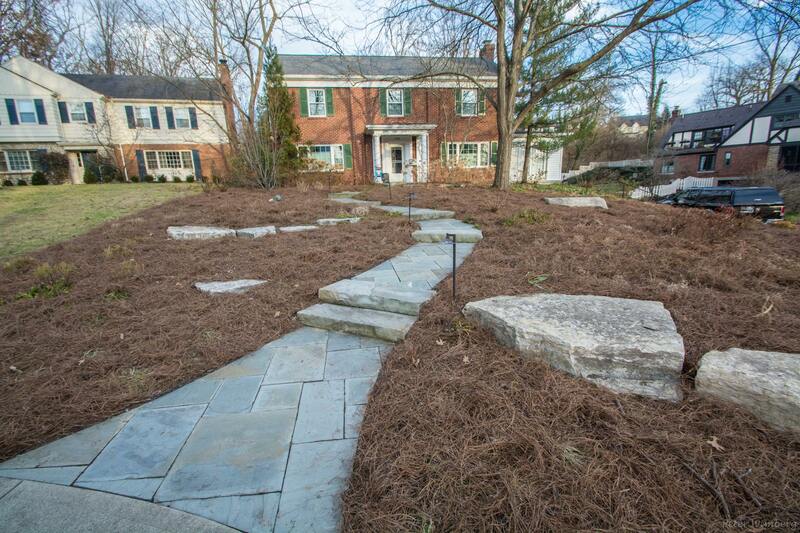 Unlike hardwood mulch, pine straw does a superior job of remaining in place, even on a hillside. Natural in appearance. Many gardens incorporate evergreens as well as azaleas and rhododendrons. Pine straw looks perfect with such plantings. Volcano mulching becomes obsolete with pine straw. Walk about a pine forest and you will see a lush carpet of pine needles. The nature of the needles are such that even if they do drift up against trees, they do not become a tight, smothering mass, as hardwood mulch is apt to do.